‘We shall demand of our architects a sensitive interpretation of society’s needs as well as the eloquent architectural statement’, appealed Prime Minister Pierre Trudeau in 1972. Architecture in Canada has been fashioned by the nation’s immense size, as well as its concentrated and diverse geography and demography. This richly informative history reveals how the country has contributed in no small measure to the spread of architectural modernity in the Americas and beyond. During the twentieth century, a distinct Canadian design attitude coalesced: a liberal, hybrid, pragmatic mindset intent less upon the dogma of architectural language than on thinking about the formation of inclusive spaces and places. Taking a fresh perspective on design production and its context, Canada maps the unfolding of architectural modernity across the country, from the completion of the transcontinental railway in 1886–87 to the tumultuous interwar decades, the period of Reconstruction post-1945, and the politically conflicted era of the late 1960s and ’70s. 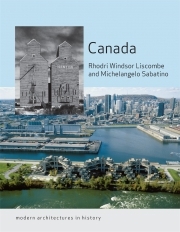 It also examines the broad pattern of Canadian political, industrial and socio-cultural evolution, urban–suburban expansion, and the technology of building. A wide array of buildings and architects, from ARCOP, Eric Arthur and Ernest Cormier, to Brigitte Shim and Howard Sutcliffe, helps to bring to life this chronologically and thematically driven story. Canada is a unique critical account of modern and contemporary architecture in a country once defined by Voltaire as ‘a few acres of snow’. Michelangelo Sabatino is Professor and Director of the PhD Programme in Architecture at the Illinois Institute of Technology. He is the author of Pride in Modesty: Modernist Architecture and the Vernacular Tradition in Italy (2011) and co-editor of Arthur Erickson: Layered Landscapes (2013).|Rhodri Windsor Liscombe is Professor Emeritus at the University of British Columbia. His books include The New Spirit: Modern Architecture in Vancouver, 1938–1963 (1998) and Architecture and the Canadian Fabric (2011).